Hi everyone! Today I have a stunning summer collection to show you. 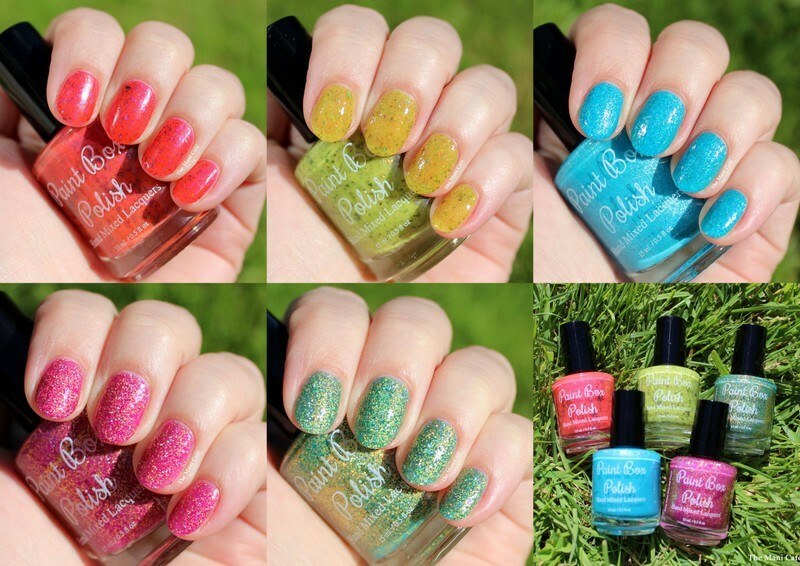 This is the North Shore collection from Paint Box Polish, a mix of Hawaii-inspired brights. There are flakies, glitter and glass-flecks for a fun variety of textures! I also had the opportunity to try out one of the mani fizzes Pam has recently added to the Paint Box Polish shop! I'll tell you more about that at the end of this post. So, on to the polishes! Pam's colour descriptions are in blue. North Shore Shrimp Shack - coral creme with blue/purple shifting UCC flakies. Makes me want to order some Giovanni's. Mmm. I used 2 easy coats of North Shore Shrimp Shack and a coat of topcoat. Formula and application were amazing and drying time was really quick. I love this unique combination of a bright coral base and the colour-shifting flakies. It's going to be a go-to polish for me this summer for sure and I'm already planning a pedi with it! Definitely one of my top picks from this collection. Sunset Beach - yellow crelly packed with gold/green shifting UCC flakies. Opaque in 3-4 coats, super juicy looking in 2 coats, or layer over a yellow. I used 2 squishy easy coats of Sunset Beach and a coat of topcoat. The formula and application were really great and drying time was quick. I'm not a huge yellow fan generally but this is really wearable and fun for summer! I love the coloured base with the metallic flakies. This colour, as you can see in the photos, has a tendency to pull a little chartreuse on me. I bet it would look amazing on darker skin tones too. I'm looking forward to trying this layered over yellow too. So many possibilities! Waimea Waters - blue-green packed with gold holo glitter. Like the sun reflecting off the water! Opaque in 2-3 coats. I used 2 coats of Waimea Waters and a coat of topcoat. The formula is slightly on the thicker side but application was fine and I didn't have any issues. The finish on this one isn't totally smooth but isn't really gritty like some glitters either. I found that one good coat of topcoat smoothed it out perfectly. This is an original polish in my collection and I love the green/gold combo. It's so sparkly in the sun and made my camera freak out! Haleiwa Town - berry purple sister to Waimea Waters (and A Dragon Is Not A Slave from my fall 2014 collection). Opaque in 2-3 coats. Like with Waimea Waters, I used 2 coats of Haleiwa Town and one coat of topcoat. The formula was also on the thicker side but application was fine. No issues to report. The finish is the same as Waimea Waters and one good coat of topcoat was sufficient to smooth things out for me. Again the prominent gold glitter in this is just beautiful and I cannot resist a good berry/purple shade! I'm currently wearing this as my pedi and absolutely love it! Blue Above The Bay - a bright blue cream scattered with white and blue flakies. Opaque in 2 coats. I used 2 coats of Blue Above The Bay and one coat of topcoat. The formula was excellent and drying time was good too. It is so pigmented and buttery that it was almost a one-coater for me. 2 leveled things out to perfection. I love how bright and happy this is and the white flakies are just gorgeous. This is my favourite from the collection. I really love this collection and I think there is something for everyone with the different shades and textures. I haven't been to Hawaii but I can definitely see the inspiration behind these! Wearing Hawaii-inspired polishes will do for me for now! My favourites are Blue Above The Bay and North Shore Shrimp Shack. I can see myself wearing these a lot this summer! Which is your favourite? Finally, I got to try out one of the new mani fizzes that Pam has added to her product line-up. Pam has unique and lovely scents for her nailcare products so I was really looking forward to trying the mani fizzes. The fizzes are made by a friend of Pam's and are available in the following scents: Beach Bum (suntan lotion scent specifically designed for the North Shore collection), Green Tea & Eucalyptus and White Tea & Coconut. The fizzes contain coconut oil, almond oil, aloe and vitamin E for moisture. To use the mani fizz, you plop it in warm water and soak for about 10 minutes, rub hands together and pat dry. I tried out the White Tea & Coconut scent because I'm a sucker for anything coconut. I tried the mani fizz after a swatching session. My hands are quite dry at the moment anyway and needed a bit of pampering. I followed the instructions and soaked my hands for 10 minutes. The White Tea and Coconut scent was lovely and made my nail room smell great! The fizz made my hands feel soft while soaking and very moisturised afterwards. I needed to rub my hands quite well to absorb the oils, like when I use one of my more intensively moisturising hand creams. I would recommend waiting a while to paint your nails or removing the oils from your actual nail before using polish (though I feel in a way that this would defeat the point). I'd definitely purchase and use these fizzes now, they would be lovely as a part of a once a week nail care/manicure routine to pamper my hands and nails and relax! This collection is releasing June 27. Sunset Beach and North Shore Shrimp Shack will retail for $9.50 each and the other 3 shades will be $9.00. 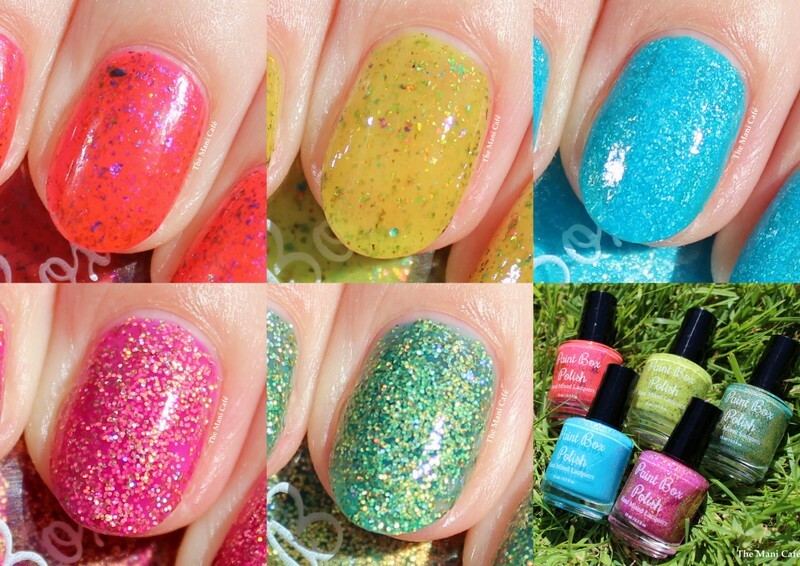 Mani Fizzes will retail for $1.50.